Five LC students participated in the Virginia Foundation for Independent Colleges (VFIC) 13th annual statewide collegiate Wells Fargo Ethics Bowl on February 12-13, on the campus of Shenandoah University in Winchester, Va. 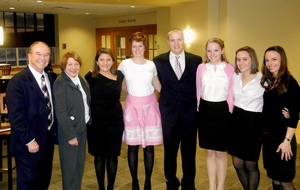 The University of Lynchburg student team, coached by Dr. Laura Kicklighter, associate professor of philosophy, included: Katherine Chappell ’12, Elizabeth Childress ’12, Zachary Hughes ’13, Jillian Gates ’13, and Courtney Zongrone ’15. The team finished 2-2 with wins over Hollins University and Shenandoah University. LC lost to the University of Richmond and Hampden Sydney College, which went on to win the competition. Serving as co-chairs for the event were Roger Mudd, author and former journalist for CBS and The History Channel, and LC President Kenneth Garren. Many notables from the business sector, law, education, finance, journalism and other fields judged team presentations and offered reactions to the students’ presentations. Founded in 1952, the Virginia Foundation for Independent Colleges is a nonprofit fund-raising partnership supporting the programs and students of 15 leading independent colleges in the Commonwealth: Bridgewater College, Emory & Henry College, Hampden-Sydney College, Hollins University, University of Lynchburg, Mary Baldwin College, Marymount University, Randolph College, Randolph-Macon College, Roanoke College, Shenandoah University, Sweet Briar College, University of Richmond, Virginia Wesleyan College and Washington & Lee University.